Yet, the reaility is this next-generation tech remains extremely expensive to fabricate on a mass scale. Reuters’ reports that Japan’s biggest automaker, Toyota, is struggling to overcome development challenges with solid-state batteries, a high-capacity energy storage technology set not only to replace lithium-ion batteries but also revolutionize the electric-car industry by offering greater range, better safety, and crucially, a recharge time of just a few minutes. Current batteries for use in electric vehicles (EVs) use liquid electrolytes, substances which by their very nature present fire safety issues. Solid-state batteries on the other hand, and as the name suggests, use solid electrolytes (sodium instead of lithium) to transport ions between negative and positive sides, a material with less overheating or causing-fire tendencies. Furthermore, the energy density aspect in solid electrolytes – the amount of electricity that can be contained in a given volume – is much higher, meaning longer-range, faster accelerating EVs with smaller, lighter battery packs. But despite the potential this next-generation technology offers, solid-state batteries, besides remaining extremely expensive in terms of cell-fabrication on a mass scale (successful commercialization means the cost of producing a kilowatt hour of electricity must fall from a little under $200/kWh that is today, to around $100/kWh), are still largely unproven from a practical application standpoint that seems limited at the present stage. 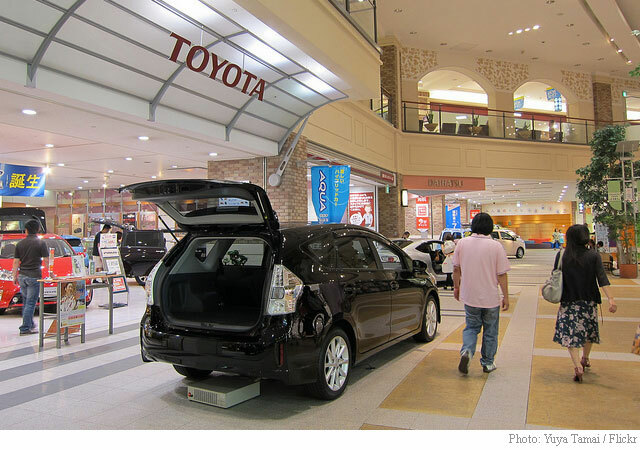 And that means, Toyota, whose goal is to put solid-state batteries into production by the mid-2020s, still has a long way to go before it can become the first automaker to adopt the benefits of this new tech. “We are scrambling to finish developing this technology, but a few issues still remain as we try to mass produce this,” Takeshi Uchiyamada, Toyota’s chairman said in an interview with Reuters at the 2017 Tokyo Motor Show. Toyota certainly won’t be a success market-share-wise with a limited lifespan battery. The competition in this newly developing arena that also targets the very lucrative mobile applications market, is getting cutthroat by the hour with dozens of companies including Tesla (NASDAQ:TSLA), Volkswagen, Bosch and Dysonare collectively pouring billions of dollars of R&D funding to come up with lifespan battery strategies that can produce safer higher volumetric energy density devices that have enough charging capacity to really compete with petrol engines. Toyota however, seems undeterred from its goal of commercializing a solid-state battery breakthrough during the first half of the 2020s. The company said it plans to continue developing fuel cells while at the same time increasing production of hydrogen-powered cars tenfold over the next few years. It should be noted, the automaker has faced numerous issues with the high cost and slow rollout of its hydrogen infrastructure which includes plans (make that ‘bold plans) to have 200,000 Mirai hydrogen fuel cell cars on Japanese roads by 2025, and 800,000 by 2030-with a fleet-serving expansive network of 900 fueling stations. Whether Toyota will succeed in achieving its lofty goals remains to be seen. In the meantime, they believe that both electric-battery cars and hydrogen fuel-cell technologies (Japan is currently the largest market for hydrogen vehicles) will be needed to ultimately replace gasoline cars.